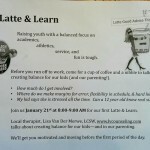 On January 21st from 8 – 9 a.m. I will be at Webb Bridge Middle School in Alpharetta to discuss stress management techniques and how to bring more balance to your children’s lives. Please contact school social worker Stephanie Schuette if you need additional information.